TwentyOne is an awesome app that brings you the best of all your favorite social networks into a beautiful and interactive interface. This new service comes with the idea of filtering the vast amount of information created by our friends in social networks, based on your personal preferences. TwentyOne will help you to understand who is relevant and what content is most important for you. Add your Facebook, Twitter and Instagram accounts into TwentyOne and you will receive a valuable recommendation of your friends and content that you most like. 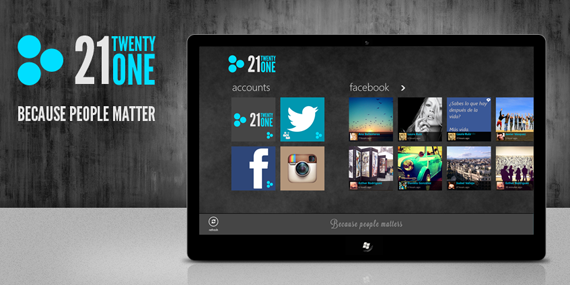 TwentyOne will keep you updated of the most interesting things that are happening within all your social networks, all this in a comfortable and quick way. Choose your 21 best friends from each of your social networks (Facebook, Twitter, Instagram). Get the most interesting activities of your friend based on your preferences. Give feedback about the content that you like or dislike and TwentyOne will learn about your preferences.